I am trying the latest version on Synergy on the daily build of Ubuntu 17.10 (as client). The server is a Windows 10 host. I can see "entering screen" and "leaving screen" info messages, however the mouse does not move and keyboard input is ignored. Debug logging shows that the client receives input ("recv mouse move", "keystroke", etc. ), yet the mouse cursor does not move and keyboard input has no visible effect. 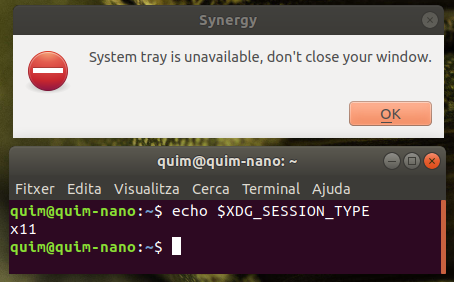 Is there any info on how to get Synergy working on Ubuntu 17.10? I understand this version of Ubuntu is not released yet and my expectations are set accordingly. I have the same issue, wondering if there are any solutions. Same here when server is Ubuntu 16.04 and client is Ubuntu 17.10. I'm using Ubuntu 17.10 for server and Windows 10 for client, move movement works, except when on the ubuntu machine terminal is opened and maximized, in which case I can't move the mouse cursor to the client. Keyboard works mainly well, except for alt+tab, which executes on the server even if the mouse cursor is on the client. Running 1.8.8 on a Windows 10 Server, and Ubuntu 17.10 client. Confirmed as well. Windows 10 and Ubuntu 17.10 using 1.8.8. Changing to ubuntu xorg works. This is just a warning. .. If you click OK, the program is shown, because it can't display the icon in the system tray. ... API is different, since ubuntu switched to gnome UI from Unity. For me the connection is established, as soon as it shows the program UI. @Getex Informatica did you switch to "ubuntu xorg" as I wrote above? Did you click OK? ... Then you'll probably need to wait several seconds. .. I think there are some timeouts involved. ... For me after about 5 seconds the config UI pops up and the connection can be configured and it is established, once it is configured. yes, I clicked to accept but the user interface never appears. I have totally removed and I have installed again. Synergy now works but the graphical interface still does not appear. Running 1.8.8 on a Windows 10 , and Ubuntu 17.10 client. I confirm ubuntu xorg works perfectly with the keyboard and the mouse. I've had the same issue ... or lets say it looks for me like these issue because the solution was pretty easy and unexpected. 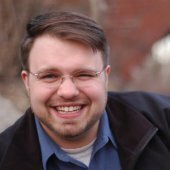 synergy connected from ubuntu 17.10 and windows 10 successfully. Not sure if this will work for you, but after plugging a mouse into the Ubuntu box, I get full Synergy functionality between Windows, Mac and Ubuntu machines. Do note that you can remove the mouse and the cursor will still display and work fine, but if you logout, you will have to plug in the mouse again. Not ideal, but a working solution. I have the same issue, but I can actually type at windows (like the terminal window), and if I click and drag on the desktop, I can see where the mouse is. It just doesn't match the location of the pointer, which does not move. The dock appears to ignore input from keyboard or mouse, even though the desktop kinda sees it, and client windows definitely take keyboard input. If a support ticket has not been submitted, I can certainly do so. I just don't want to duplicate effort.